Carlitos Espinoza & Noelia Hurtado (Buenos Aires) have been dance partners since 2011 and are one of the favorite couples of tangueros all over the world! They bring tango back to its roots, the feeling of two bodies moving together in perfect harmony, expressing the music with their partner. 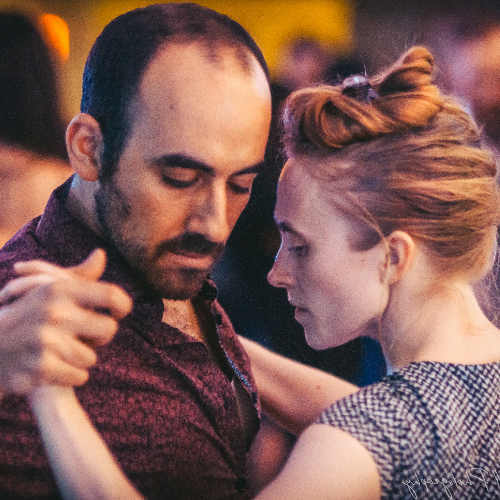 They have inspired countless dancers and teachers by taking tango back to its essence of feeling, connection, and musicality. Their unmistakable style celebrates close embrace and elegance with energetic dynamics that will take your breath away. They transfer music into the movements of the body, turn their dance into an sublime sensual experience. Carlitos is the master of musicality, and Noelia is one of the most influential female dancer of the generation with large crowds of followers all over the world. They have become invited teachers and performers at many of the most famous tango festivals in the world, and their Youtube videos have been viewed more than a million times. Carlitos Espinoza has been dancing for eighteen years and has acquired an enviable reputation throughout the tango world for his authentic close-embrace milonguero tango. His style is characterized by a rare combination of extreme dynamism, profound musicality, energy, precision, and a very grounded and elegant walk. As an instructor, Carlitos is masterful. He works on multiple levels with students, simultaneously developing technique and mechanics while challenging the students interior landscape, and their process of conceptualizing while they lead or follow. Noelia Hurtado started her tango journey in 2003. She studied intensively with maestros Carlos Perez and Rosa Forte where she learned the basics of the well-known Villa Urquiza style. Her dance, fast and responsive, modulates the energies of the dancer and the dance music fusing them into a soft and smooth aura. Each tango's harshness is softened to the extent that the couple looks as if they were dancing in the air rather than on the ground. Eleonora Kalganova is a unique, generous, sensitive, and kind teacher. She grew up in post-Soviet Tashkent, Uzbekistan (part of the former Soviet Republic). She studied dance extensively from an early age: folk, ballroom, character, historic, ballet and modern. After successfully completing 9 years of rigorous study, Eleonora graduated from the State Dance Academy in Tashkent and became a principal dancer with the prestigious Alisher Navoi Theater of Opera and Ballet. Through this remarkable and rare educational experience she gained a solid understanding of movement, anatomy, music, performance and dance composition. With time, Eleonora became increasingly fascinated and involved with Argentine tango. After years of study, with intelligence, passion, professional dedication, and her unique dance background, Eleonora started to develop a very special understanding of Argentine tango. Eleonora believes in breaking from the rigidity of steps and memorization. She encourages students to develop improvisational skills through simple and dynamic techniques, achieve relaxed and released style, and most importantly, learn the joy of dance by relating, expressing, and communicating with her partner. She has been described by a reviewer as "the most talented and playful follow I have ever seen" and "it is rare when I watch a couple dance and ONLY focus on the woman. She is that kind of dancer". Eleonora travels extensively internationally, performing and conducting workshops around the world, where her famous Womens Technique classes bring out large numbers of eager fans. But she continues to be a student of life and tango. Alberto ('Tito') and Micaela (Mica') will teaching the beginner classes. This is a weekend intesive course that gets you up and dancing within one weekend of classes. In the Beginner Intesive couse you will learn the fun, elegance, grace, improvisation skills, as well as the secret tango etiquette. You will be introduced to Tango structure, technique, and musicality that will get you up and going on the dance floor.